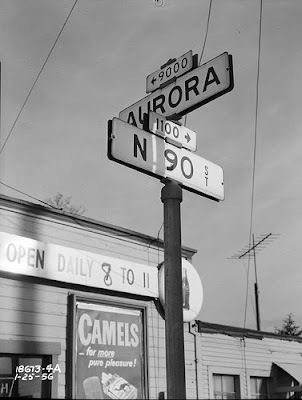 Seattle street sign, 1956. Courtesy of Seattle Municipal Archives. I aimed the nose of my minivan in the general direction of Green Lake, which promised respite from the record heat, but my optimism at navigating Seattle’s rush hour traffic and finding this shimmering lake evaporated when I swung onto Aurora Avenue. Instead of seeing cool water and shaded paths, I was squeezed between bumpers and inching closer to the Space Needle. This was the wrong view. So I did the next thing that came to mind, I made a sharp right into a row of apartments, opened a map and turned on the GPS unit. Seattle should be a simple city to learn; most streets are governed by the compass, running either north-south or east-west. It’s an hourglass, its middle cinched by a ship canal connecting Elliott Bay to Lake Washington. It’s a city of rolling hills, speckled by lakes and ringed by tall mountains. But as I scanned the map for a street close to Green Lake, a conversation outside my window caught my attention. And then there was me and my four kids in a minivan, just a knife’s throw away. I punched in the first street I could find, hit “GO!” on the GPS screen and sped off. The kids flung questions as I followed the directions on the mini computer screen. Then slip under Aurora Avenue. Turn left. We laughed. Apparently, the street I typed in was a small stretch of road linking longer streets. We looked around, saw signs pointing the way to Green Lake and our nerve-jangling trip came to a safe end. 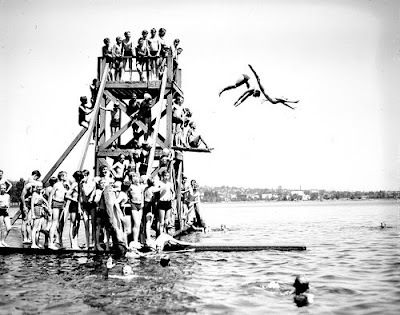 Divers at Green Lake, 1936. Courtesy of Seattle Municipal Archives. The water cooled us, the shade soothed us, and (bonus!) there was a diving board. But no one tried a jack knife. Not every day do you witness a near-stabbing on your way to the lake. City life is exciting! Your life is way more exciting than mine! I'm glad you finally found the lake! We've been living and dying by GPS on our recent travels. Love reading about your GPS adventure. Digo, buen suerte. Good luck, I say! You never know where that thing will take you.